I love when I create a wholesome dinner that takes only 15 minutes of prep time AND it complies with diets like Keto, Low-Carb, Paleo, Primal and GAPS, with a Whole30 version! 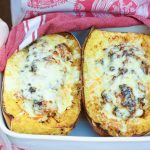 This Chorizo-Stuffed Spaghetti Squash is the perfect three-season dinner that fits all these descriptions, plus it’s delicious. This meal can be made with or without dairy — perfect and exciting to serve either way. One of my favorite parts of fall each year is seeing the winter squash show up at the grocery markets and spring from my mom’s garden. When I buy winter squash I always feels grateful for Trader Joe’s where they’re SO affordable. I can feed my family a big, filling meal without spending a bundle. If you have a Traders near you and you have yet to discover this money-saver, go see their winter squash prices! You’ll bring home a cart-full of several varieties and feel excited about the money you saved. 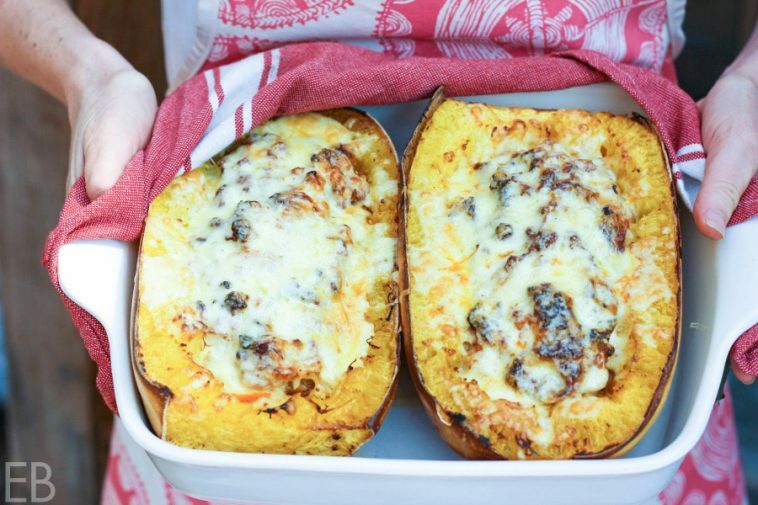 You’ll also be pleased with how this spaghetti squash gets baked. We start by baking the squash whole! This means that we don’t have to cut through a monstrous-hard thing. An initial 25-minute baking makes the squash MUCH easier to cut. Another Nice Thing about spaghetti squash? — Each half is like a boat, that serves as a casserole base! When we fill up each half, we are kind of making two casserole dishes. Isn’t that cozy? When it’s time to serve, I just get out my big knife 🙂 and cut each one in half width-wise (with a giant thwack), and each squash serves four people. I place the good-sized half-boats directly on each plate, and each person can eat their personal casserole right from the shell of sorts — with a big side of green salad. 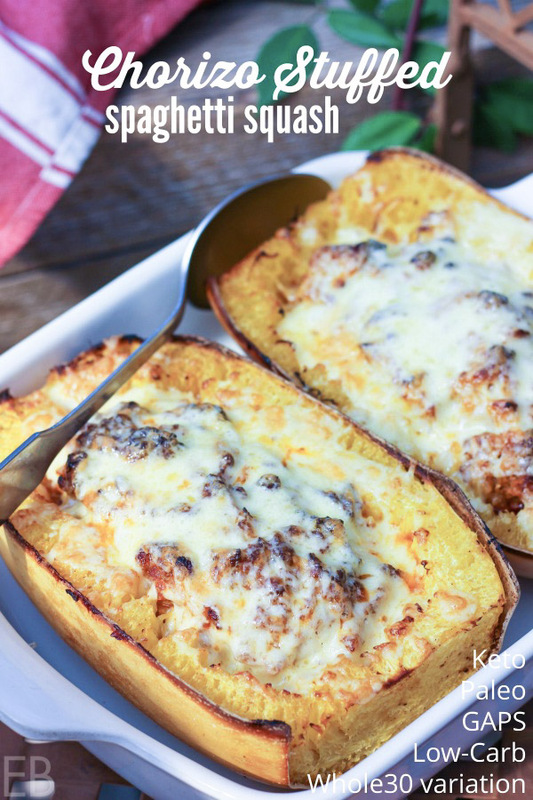 For Keto folks, spaghetti squash is low-carb, yet gives us that satisfying carb experience. Regarding chorizo, it’s the magic in this recipe! Chorizo is already rich and spicy, fully seasoned, so the work is done for us. This recipe only has 7 fast-to-grab ingredients, thanks to chorizo! I buy a couple of natural brands, depending on which market I’ve been to recently: Mulay’s is available at several markets. We also have a local meat market that makes their own. Another Nice Thing about chorizo is that it’s high in fat, which makes my body so happy, and likely yours too. (The spiced fat is also great in this recipe, because it sinks into the noodle-like strands of the spaghetti squash and creates a kind of very flavorful sauce.) Saturated fat and monounsaturated fat are our bodies’ preferred fuel source! (source) Pork fat is about 50% monounsaturated fat and 40% saturated fat, high in Vitamins B12, C, D, iron and several key minerals. Pasture-raised pigs assure greater nutrition for our bodies. If you wish to make your own chorizo, great!! (Here’s one recipe, to which I recommend adding 2-1/2 teaspoons sea salt.) Try to find a local pig farmer, and buy your pork in bulk! 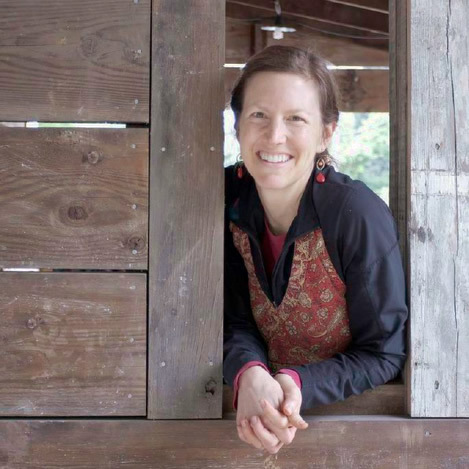 (This farm is our local source for bulk pasture-raised pork. We buy about 50 lbs at a time, pick it up at the farmer’s market and eat it most mornings for breakfast. It it THE best pork we’ve ever eaten.) This approach saves money and works well for farmers. US Wellness Meats is another great source, for those of you who need to order your meat. Fall in love with chorizo this fall 🙂 if you haven’t already! For Whole30 and dairy-free Paleo version, simply omit the cheese on top (which is the final step of the recipe). This recipe is lovely with or without cheese. Place whole spaghetti squash in oven (uncut). Bake 25 minutes. Remove from oven with two hot pads and place on cutting board. Using a hot pad in one hand and a large knife in the other, cut squash in half lengthwise. (Or let it cool slightly first.) Scoop out seeds from each side. Rub each hollow with fat of choice (so the flesh is lightly coated). Place halves upside down in casserole dish. Bake an additional 25 minutes. Sprinkle sea salt lightly over the cavity of each squash half. Fill each half of the squash with meat mixture. Place squash halves back into casserole dish (face up this time!) Bake in preheated oven an additional 30 minutes. Top with optional cheese and bake 10 minutes more. To serve, cut each half in half width-wise with a large knife, so you'll have four servings, each served within it's "shell." (You may also scoop out the flesh if you prefer, to plate the squash.) Top with optional fresh cilantro and/or green onions. Serve. Here's .99 baking soda! And did you know? What’s your favorite part of a recipe like this? Spicy?, fast to make?, winter squash?, casserole-like? Enjoy!! That looks DIIIIvine! I love chorizo…it adds SO much flavor with even a little bit!! 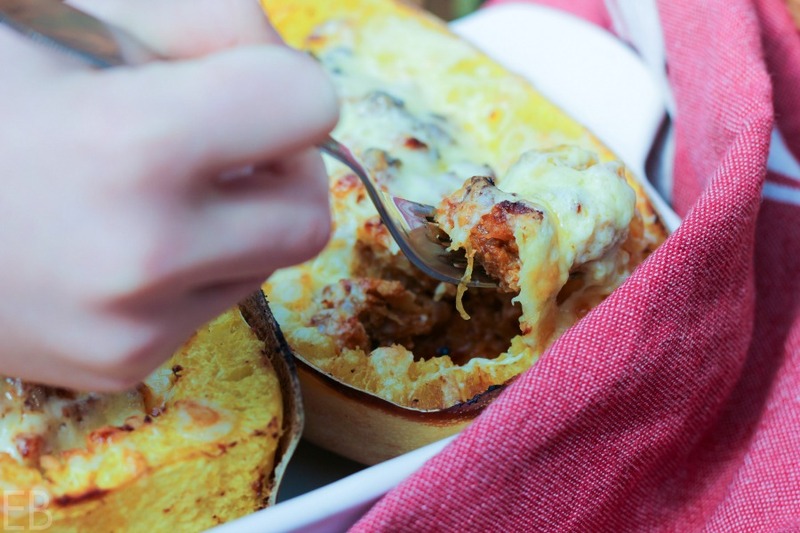 Chorizo and spaghetti squash sounds like the most amazing combo, and that creamy sauce? I’m totally sold on this, yum. Ohhh man! I totally dig this! Chorizo reminds me of my grandparents from Spain – they made it for me all the time so I took my Grandma’s seasonings and make my own blend – I know my kids would love the chorizo in these comforting spaghetti squashes! What a sweet memory!! Thank you for sharing. Those are the best foods, when linked to special family. Omg chorizo is a naughty treat my husband and I indulge in every once in a while. We usually add it to our eggs but THIS looks incredible! I need to get me a spaghetti squash ASAP! Oh my goodness. This has me drooling! I need to find some chorizo asap! Terrific!! Hope you all love it! Wow well this looks out of this world delicious! The combination is fantastic! Just made it. Fabulous!!! The flavors work so well together. I think chorizo has to be my favorite sausage! Combined with that creamy/cheesy element, this sounds absolutely incredible! LOVE this recipe. There’s a sausage making butcher in my community that makes a delightful spicy sausage that will be perfect in this recipe. Thanks so much for explaining a great way to make the spaghetti squash ‘do-able’ with your step-by-step tutorial! Is the Chorizo cooked ahead of time? No, it bakes. It’s raw when the squash get stuffed.